An interesting collection of RAF subjects from the Far East, with yet another last of the type included. 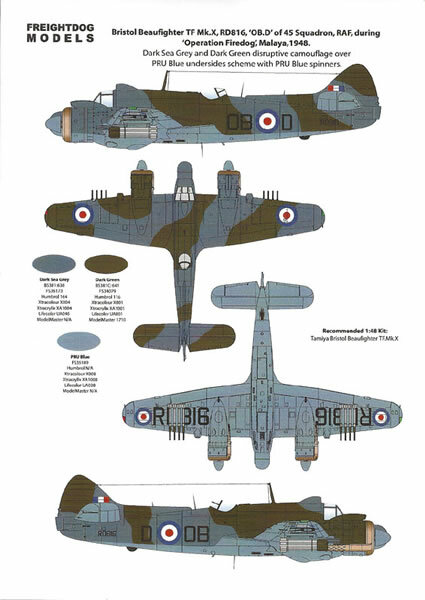 Need a now OOP conversion for the Mosquito. This sheet covers three subjects from one of the British Empire’s last wars. All three subjects are interesting and other alternatives to the run of the mill subjects, not to mention the very last RAF operational Mosquito sortie airframe. In the spirit of full disclosure I want to declare up front I am a big fan of Freightdog Decals, having bought many of their sheets since they emerged on the UK scene few years ago. Being an FAA and Spitfire fan they have provided for me a source of many and varied schemes, many of which I have wanted to model for many years. 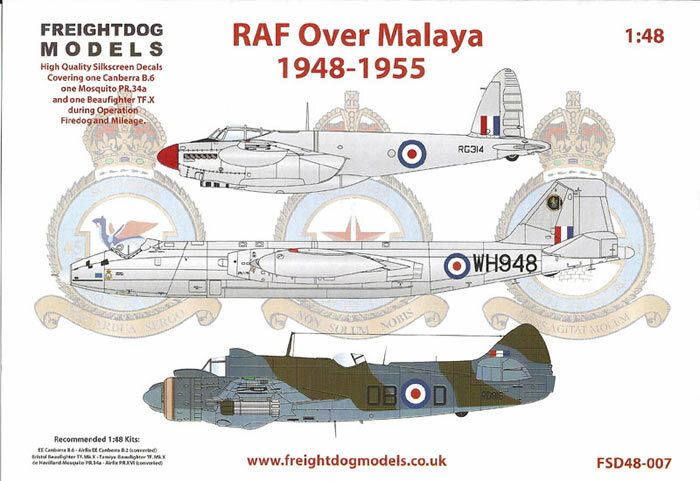 In keeping with a tendency to provide subjects from many of Britain’s small wars, this latest sheet covers three aircraft types that served in Operations Firedog and Mileage during the Malayan Emergency. Operation Firedog covered RAF air support operations in Malaya from 1948 to 1960 and included RAAF and RNZAF units operating alongside RAF units. Operation Mileage is less known and covers the deployment of RAF Canberra bombers to RAAF Butterworth, Malaya, from March to August 1955. Given the span of Operation Firedog, many RAF types served in the theatre from immediate post war Spitfire, Mosquitio and Beaufighter units to later Lincoln, Vampire, Venom, Canberra and Sabre types. DH Mosquito PR34A RG314 RAF Seletar 1955. This aircraft carried out the last RAF operational Mosquito sortie with 81SQN on 15 December 1955. EE Canberra B.6 WH948 of 101SQN deployed to RAAF Butterworth, Northern Malaya during Operation Mileage. Bristol Beaufighter TF.X RD816 of 45SQN RAF in Malaya during the early phases of Operation Firedog in 1948. Whilst the first two subjects are in typical post war High Speed Silver schemes, the Beaufighter offers a variation on a theme that is something off the beaten track compared to the usual World War II schemes. In this case a disruptive pattern of Dark Green and Dark Sea Gray over PRU Blue more commonly associated with RAF aircraft assigned to 2TAF in Germany. The decals are well printed and although the printer is not noted they have the feel of a Fantasy Printshop product. Instructions are good, being printed on a double sided A4 page with full colour four view drawings for the three subjects. Specific notes for the smaller details are also included in the instructions. 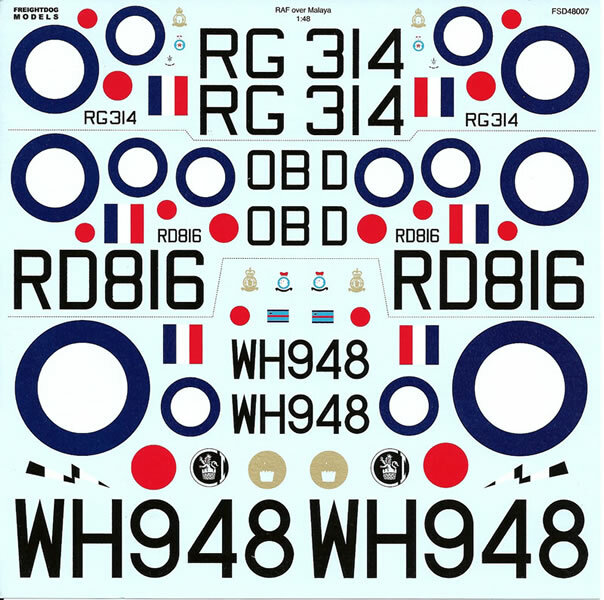 Complete decals for all three subjects are also provided. Overall this is another good product from Fantasy Printshop and one that I congratulate them on producing. I believe the immediate post war period is an untapped vein from RAF subjects and Freightdog appears to agree. 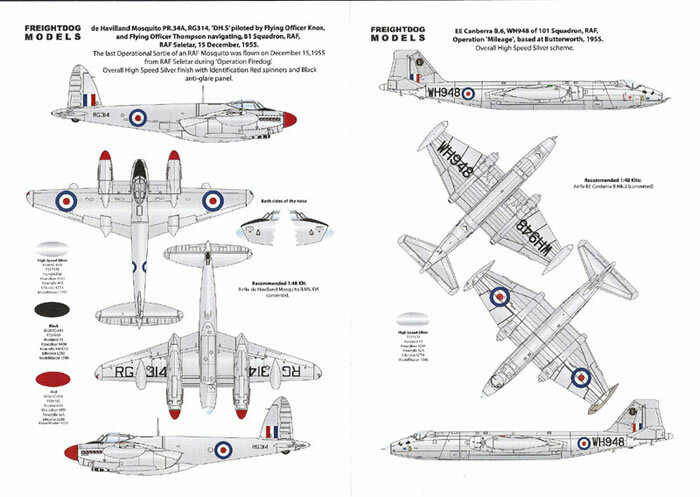 If there is a drawback with this sheet it is that sadly Paragon Designs has again disappeared from the aftermarket scene and their excellent conversion sets are necessary to model the Mosquito PR34A. If this subject interests you I would urge you to hunt down the relevant sets while they are still available.